The Aquarium's chief veterinarian Dr. Charles Innis has been called upon to report to the Gulf of Mexico oil spill. Dr. Innis will depart on Sunday for New Orleans and report to the Audubon Aquarium of the Americas (AOA). AOA is one of four designated institutions to receive oiled sea turtles. The four designated institutions have been supplied with specialized equipment to deal with the hazardous material covering these animals. Protocols for decontamination have been established and all personnel have been trained in hazardous material safety procedures. I know what you are thinking...Why is Dr. Innis waiting until Sunday? Excellent question! To date there are only three oiled sea turtles in rehabilitation. On Monday, wildlife experts will begin regular vessel based surveys. To the best of my knowledge the surveys are expected to include aerial support. The pairing of vessel based surveys with aerial spotters is expected to result in the rescue of between 5-15 animals per day. These numbers are estimates and many factors will impact the outcome, in reality it will most likely be variable. The surveys may yield fewer then 5 animals on some days and greater then 15 on others. We will know a lot more after several days of survey effort. 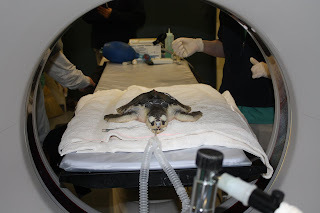 Now as for a quick update - when I last blogged on the Deepwater Horizon oil spill, I showed photos of one of the two Kemp's ridley sea turtles undergoing care at AOA. Since then only one other sea turtle has entered rehab, a loggerhead. In the photo below a de-oiled loggerhead sea turtle waits for the pool to fill. 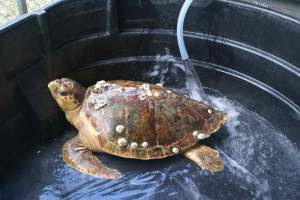 In addition to the three oiled sea turtles in rehab, over 200 have washed up dead. None of these 200 dead sea turtles showed external signs of oil contamination. Twenty dead dolphins have been collected however none showed external signs of oil contamination. To date no manatees or whales have been found oiled. When possible, Dr. Innis plans to blog on this site so stay tuned for first hand reports of his experiences working to save oiled sea turtles threatened by the Deepwater Horizon spill. As Connie mentioned in this previous post, only volunteers with certain qualifications are being called to help rescue animals affected by the oil spill. People often ask the Rescue Team how they can help in general. Some of those ways can be found in this post. Beach Released Mass Stranded Dolphins - On the Move! With all the interest in the oil spill I haven't provided you with an update on the two satellite tagged dolphins from the March 11, 2010 mass stranding. For details of the stranding click here. At last report, one animal #62, had made it's way southeast and was staying off the coast of Delaware out on the edge of the shelf. 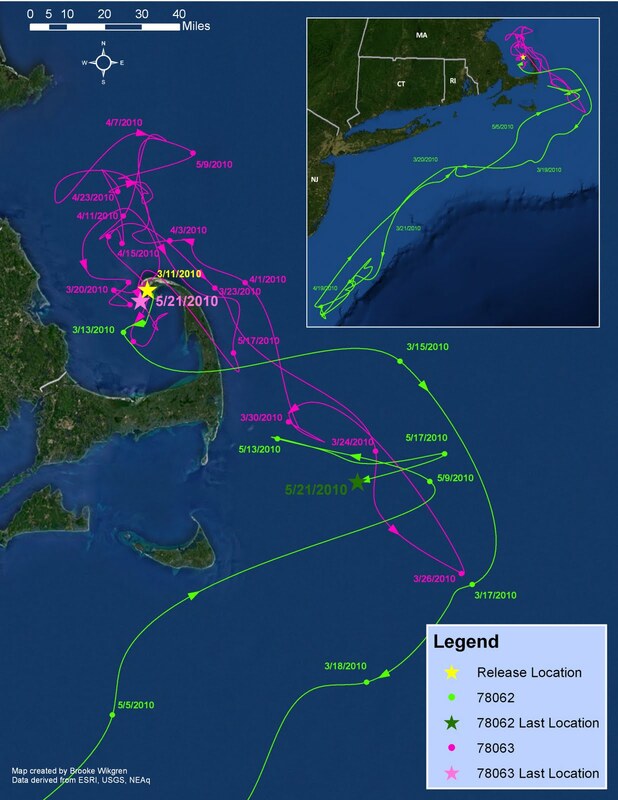 The second animal, #63 has displayed site fidelity to the Gulf of Maine by staying in and around Cape Cod Bay, Stellwagen Bank and the Great South Channel. After spending weeks near the shelf, #62 is heading back toward the Great South Channel (Yes, back this way!). For a short time it looked like the two animals, stranded together and released at the same time with others from the stranding site, would soon come together. Unfortunately #63 headed back inside Cape Cod Bay as #62 approached the Great South Channel. Check out the incredible map below by Brook and Kerry, our GIS experts. The track in green is animal #62 while #63 is shown in pink. Look for the green and pink stars for the last location of each animal. Of course when you're a talented GIS expert you can also make animated maps (thanks Brook and Kerry)! This animation highlights the travels of each dolphin on each day their tags sent data to the satellite system. Hunker down, make some popcorn and enjoy this beautiful animation! As a biologist with a high stake in the survival of these animals, it brings me great encouragement to see the data presented like this. These animals are displaying significant energy output in their travels. We have begun analyzing some of the dive depth data and swim speed data, which also demonstrate that these animals appear to have reentered their normal habitat after the stranding event. Stay tuned for more updates as these two animals begin to move closer together. This is data that exists no where else in the world folks so you are on the front line of science! 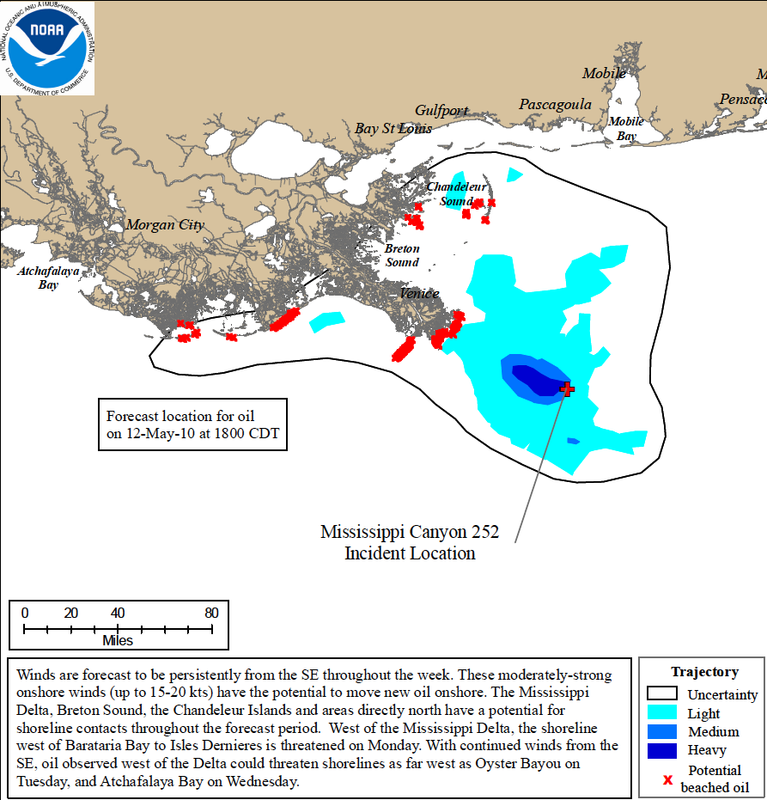 I interrupt this regularly scheduled blog to bring you breaking news from the Gulf of Mexico oil spill. 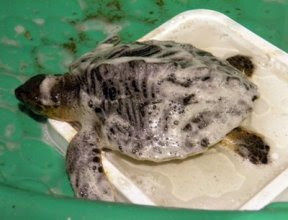 The first Kemp's ridley sea turtle was rescued from the oil slicked waters of the gulf. I have read conflicting reports but to be inclusive and not leave anyone out...the turtle was collected by a team including members from the Florida Fish and Wildlife Commission, the Louisiana Department of Wildlife, the NOAA Fisheries Service, the Louisiana Marine Mammal and Sea Turtle Rescue Program, the Audubon Aquarium of the Americas (AOA) and the US Fish and Wildlife Service (I'm guessing it was a big boat!). The team collected the animal while conducting a vessel based sea turtle survey. The animal was found completely covered in oil approximately 30 nautical miles off the Louisiana coast. 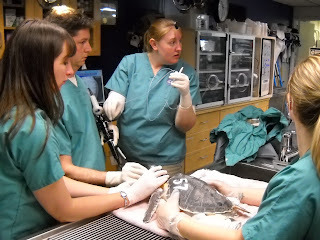 The turtle was brought to AOA for a physical exam, cleaning and veterinary care. Dr. Cara Fields and sea turtles coordinator Michelle Kelley from AOA lead a team of experts in the cleaning and care of this turtle. The photo below shows the little Kemp's undergoing the cleaning process. The oil is difficult to remove from the skin and shell. The experts at AOA used Dawn dish washing detergent to break down the oil and gently scrubbed it off with a toothbrush. Dawn is commonly used in wildlife de-oiling stations for birds and other species. 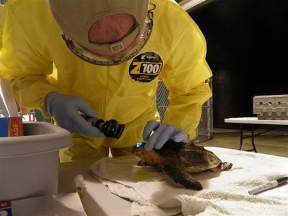 In the photo below the rescued sea turtle receives a physical exam. It appears that the vessel based surveys will continue throughout the weekend and possibly longer based on their success. AOA and 3 other local agencies have been set up as the primary critical care facilities for all oiled sea turtles. These facilities were selected based on their expertise with sea turtles, available hospital space and geographic location. 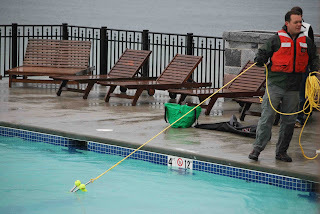 Each facility has been prepared with the appropriate equipment and the proper safety gear necessary to work with these exotic animals and the hazardous material that they will be covered in upon arrival. As you can see in the photo above, personnel will be completely covered to prevent contamination and human health risks while working with the oiled animals. 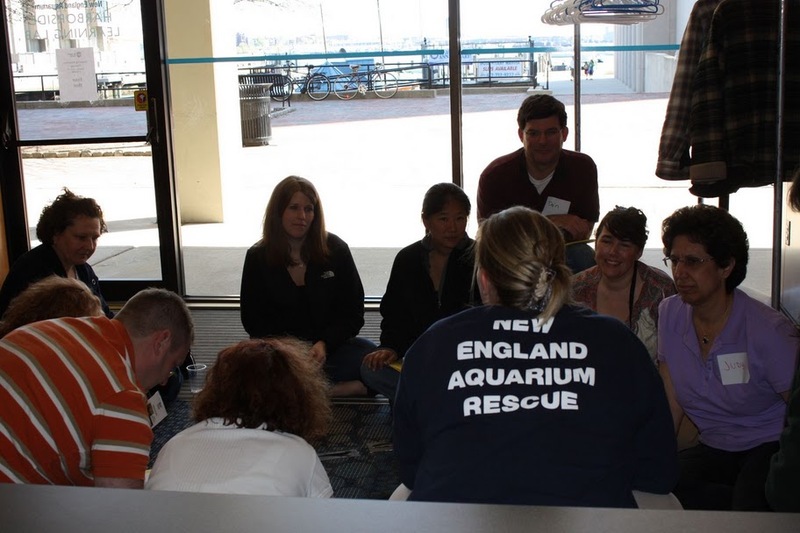 The New England Aquarium stands on high alert, with expert staff ready to heed the call if requested to assist at one of the above facilities or to potentially receive animals after the de-oiling phase. Resource needs remain to be seen and will become known as this disaster continues. I will do my best to keep you updated as new information becomes available. WORKSHOP...ONE AREA WHERE SIZE MATTERS! Okay enough with the giant letters, I think I made my point. (If you are just jumping in on this blog, click here and here to catch up. 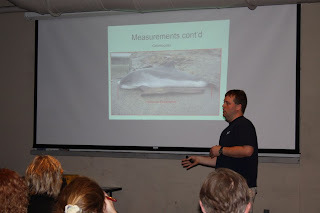 But in short, Adam and I attended a large whale workshop at the NERS (Northeast Region Stranding Network) conference.) 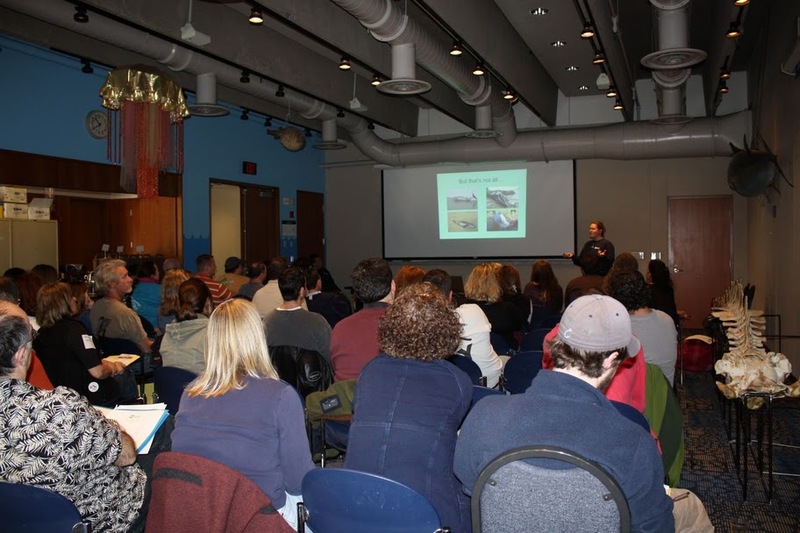 Keep in mind that this workshop focused on large whales found deceased floating at sea or found dead on the beach. 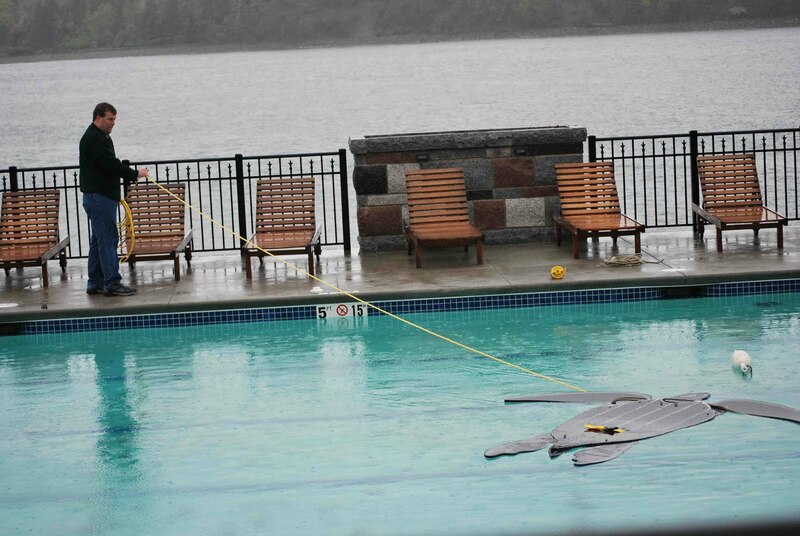 Live large whale response was covered at a separate workshop at a different meeting. 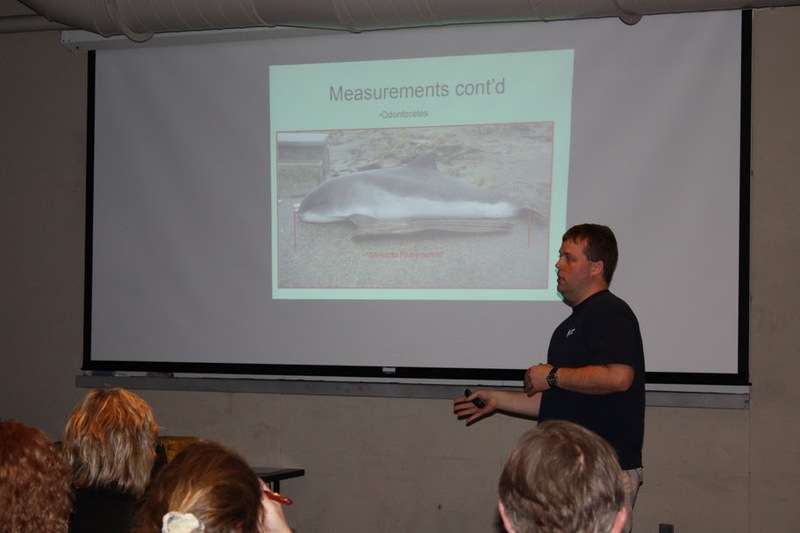 The workshop was hosted by Susan Barco from the Virginia Aquarium Stranding Program and Bill McLellan from the University of North Carolina at Wilmington. Sue and Bill have years of experience performing detailed dissections on large whales and shared their knowledge with the group. Tricks of the trade included the best type of heavy machinery to move these mammoth animals, safety of the dissection (necropsy) team, tissue examinations, sample collection, sample preservation and much much more. Below Sue and Bill answer questions from the workshop participants. After a short coffee break, sponsored by those nice folks at the College of the Atlantic, the workshop continued with several case studies from other network members. Once the case studies were presented a group discussion followed which generated some excellent dialog and great ideas. In the photo below Dr. Cindy Driscoll (doctor of veterinary medicine) reports on the case of a difficult large whale event in her region. Apparently a ship came to port with a dead whale strapped to the bulb on the front of the freighter. Dr. Driscoll shared with the group the challenges she faced, her problem solving techniques and her follow through plan. In the photo below, the presenters gather at the front for the discussion phase of the workshop. These cases studies were an excellent vehicle for the information and to generate thought among all who attended. The discussion was dynamic and energetic. As a matter of fact we got so caught up we exceeded the end of the workshop by an hour. This was an important conference with interesting, informative and motivating workshops. We had a lot of participation from locals, in particular students from the College of the Atlantic. The mix of participants added to the experience. I am looking forward to next year's meeting already! 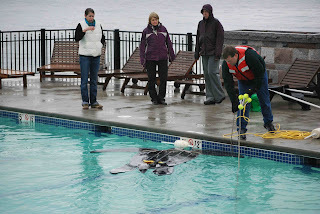 I decided to postpone the NERS workshop blog post in favor of an oil spill update. The spill is generating a lot of questions and concern so this issue clearly takes precedence over a more lighthearted blog, I'll get to the workshops later. Since the beginning of the oil spill disaster, over 100 sea turtles have washed up dead along a vast stretch of coastline in the Gulf of Mexico. Those animals are being carefully dissected by NOAA Fisheries pathologists and so far have shown no visual signs of oil contamination. Histology samples are being collected in each case for histological examination and will reveal more information once those tissues have been examined in the lab. As I mentioned in a previous blog, it is important to note that this is typically a busy stranding time in the Gulf region. However, I do not know how 100+ sea turtles compares to a "typical" season in that region so I will refrain from making assumptions. The dolphin count is significantly lower then the turtle count, with a total of 6 dead bottlenose dolphins. As in the case of the sea turtles, these dolphins did not show external signs of oil contamination. Histological findings will be important on these animals as well. According to the International Bird Rescue Research Center (IBRRC) blog, 12 oiled birds have thus far been documented. Species include: brown pelican (3), Northern Gannet (5), Green Heron (1), Laughing Gull (1) Magnificent Frigatebird (1) and Royal Tern (1). This site has a chart of the impacted birds and the species, which is a great quick reference guide to the oiled bird count. I'm not entirely sure but I believe the chart might be only for animals found alive. I noticed the mention in the IBRRC blog of a dead Surf Scoter collected from a beach however I do not see this animal listed on the chart. I borrowed these photos directly from the ICRRC blog. 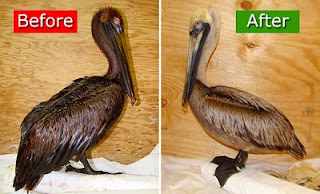 The photos show a brown pelican before and after the animal had been cleaned of the oil product. What a dramatic difference in this animal post cleaning! Also of great importance and concern are new projections out this morning posted on The Weather Channel (TWC) website. 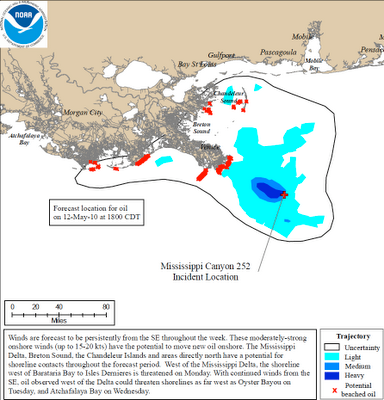 Authors Tim Ballisty and Jon Erdman wrote a great article on the potential for this oil spill to enter the Loop Current ... if it already hasn't. Ballisty and Erdman quote Dr. Richard Knabb, a tropical expert for TWC, regarding his expert opinion based on many factors including information from researchers on the water in the Gulf, computer model simulations and NASA generated satellite images. Dr. Knabb states that "the oil slick at the surface is very near or partially in the loop current." 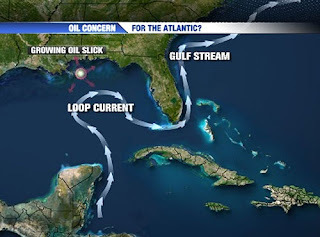 He goes on to state that "with its proximity to the northern edge of the Loop Current it may be only a matter of weeks or even days before the ocean surface oil is transported toward the Florida Keys and southeast Florida." 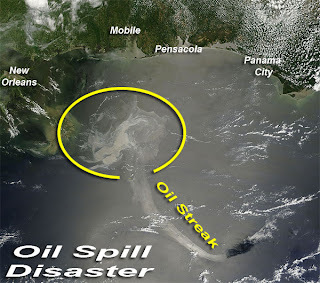 This photo from TWC website show a satellite image of the spill. Of concern is the oil slick heading in a southeast direction. Another photo from TWC website shows an image of the path of the Loop Current. This photo paints a clear picture of Dr. Knabb's concern. So far the oil has not reached the shoreline along the Gulf, good news for animals and humans. In the coming days I'll blog on the species at risk in the Gulf and provide more updates. As promised, here is my post about our recent Northeast Region Stranding Network Conference (NERS). 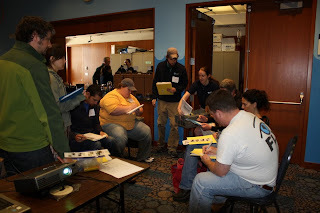 Each year all the member organizations in our region and both regional and headquarters staff from the NOAA Fisheries Services gather to review protocols, exchange information, participate in training workshops and to network. 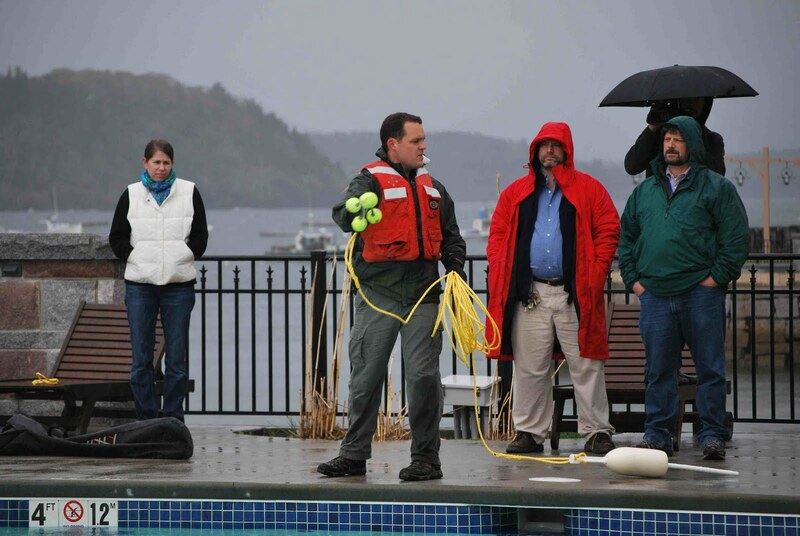 Also in attendance are members of some of our partner organizations including (but not limited to) the United States Coast Guard and NOAA law enforcement as well as students, network volunteers and interested members of the general public. 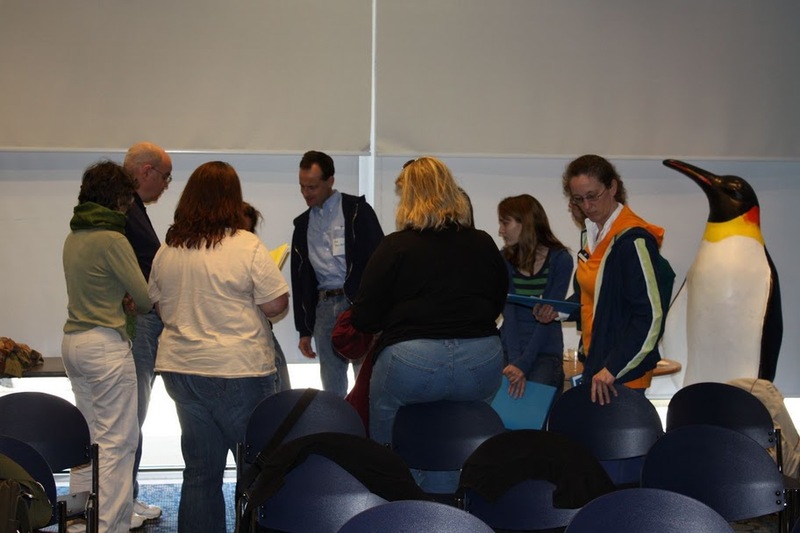 Each year a member organization, or several organizations, team up to host the meeting. 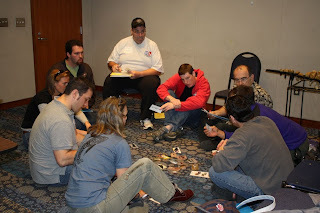 This year the meeting was hosted by three groups in Maine. The Collage of the Atlantic (which features Allied Whale), The Maine Department of Marine Resources, and the University of New England. 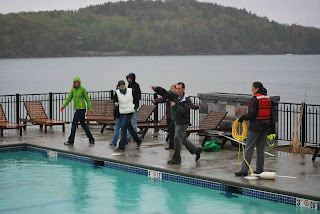 The meeting was held in beautiful Bar Harbor Maine. Adam and I arrived in the late afternoon the day before the conference. We took a short walk around Bar Harbor before heading back to put the finishing polish on our lectures. Below is a photo of the harbor and a group of informative signs strategically placed on the dock against the wall where the line forms for nature cruises. Below on the left is a photo of the lecture hall with one of our Canadian colleagues presenting. I didn't take too many in the lecture hall as the flash was potentially disruptive to the speakers and the participants. I quickly snapped the photo on the right while the moderator for this session was pulling up Kate's lecture. This is Kate's title slide, which set the stage for an excellent case study on one of our sea turtles. Bottom line - turtle is doing very well and the problem has been resolved. The closing of our NERS conference always ends with the passing of the baton, or in our case the banner, to next year's host. In the photo below, members from the three agencies in Maine pass our conference banner on to members of the Virginia team who will host this conference next year. 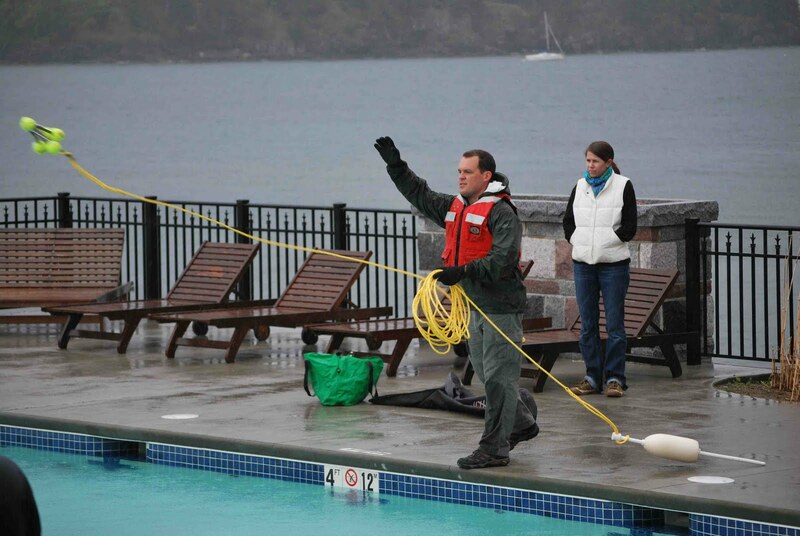 This meeting plays a crucial role in the stranding network. It provides an opportunity to exchange information through lectures, case studies, workshops and networking. Marine mammal and sea turtle stranding events are complicated on many levels. 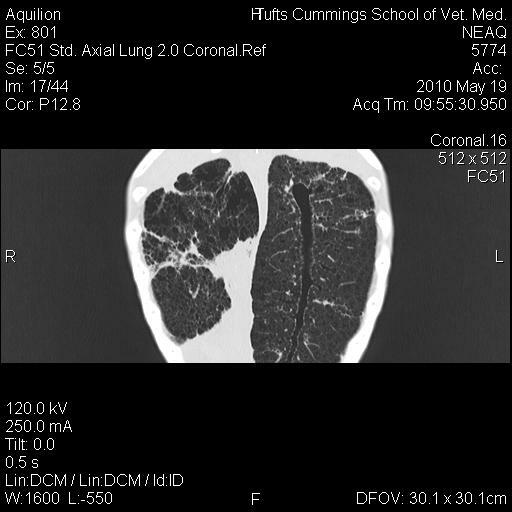 The medical condition of each animal, the geographic location, and the safety of the rescuers and the animals all have to evaluated as quickly as possibly. In addition, working within the scope of the NOAA Fisheries Service permits are all factors for each response. Meetings like this allow us to review the responses that went well and the responses that did not go well and plan, on a local and regional level, for improvements. 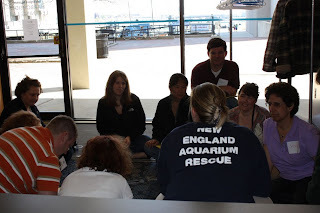 Two excellent workshops were provided at this meeting a large whale response workshop and a sea turtle disentanglement workshop. I'll be blogging on those in the next couple days. 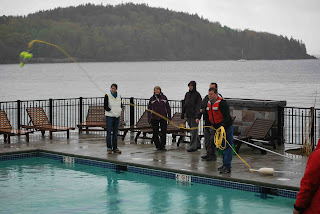 I am fresh back from the Northeast Region Stranding Network Meeting. 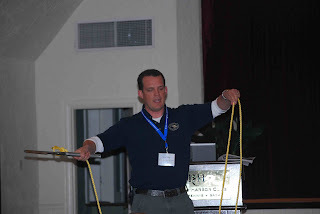 The meeting was an excellent forum for information exchange - so good it requires it's own blog! I'll post on that tomorrow. For now I wanted to provided an update on the oil spill since so many of you have shown concern and requested information. I will say that communication is difficult and a bit slow but that's to be expected with an event of this magnitude. 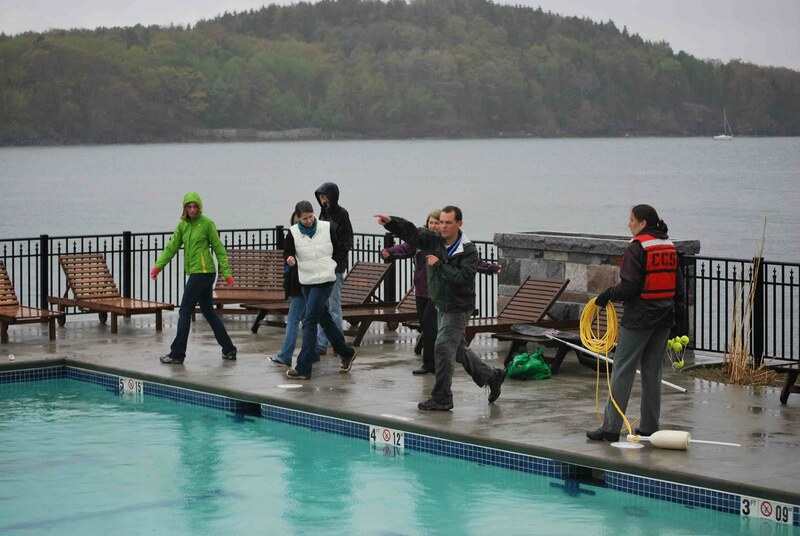 Teams on site are organized, trained and ready for oiled marine mammals or sea turtles. 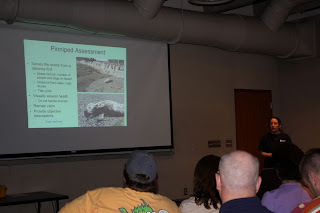 For the purpose of this blog, I'll remain focused on these two taxa since they are within my area of expertise and I have little communication with the teams working with other oiled wildlife. In order to manage a large scale event like this oil spill, the government uses the Incident Command System (ICS). Our Rescue team has been using this system to manage mass stranding events for over a decade so we are well versed in its use and application. I am a bit of an ICS geek as I received certification about 13 years ago and have been using it ever since. I believe NEAq was the first stranding team to use ICS to manage large scale mass strandings of dolphins or whales...BUT...I digress! Check out the map below for a little insider info on how the system is used. I found this map on the Deepwater Horizon site. It is called a situation map and shows the locations of all the staging areas where teams are in place as well as the Incident Command Post, the Mobile IC Post and the Unified Command Post. Check out the various keys on the bottom of the map for more information. Barbara Schroeder, the National Sea Turtle Coordinator for the NOAA Fisheries, is now on site in the command center directing all sea turtle operations. To date there have been no confirmed strandings of marine mammals or sea turtles as a direct result of the oil spill. Over 70 sea turtles have stranded along a vast stretch of coastline but none appear to have external signs of oil exposure. Detailed dissections are ongoing to rule out oil contamination through histological evaluation. I believe this is normally a busy stranding time for this region so many if not all of the cases so far may be unrelated to the oil spill. That will be determined through histological exam. One of the most important tools the Incident Command Team will use can be found in the map below. 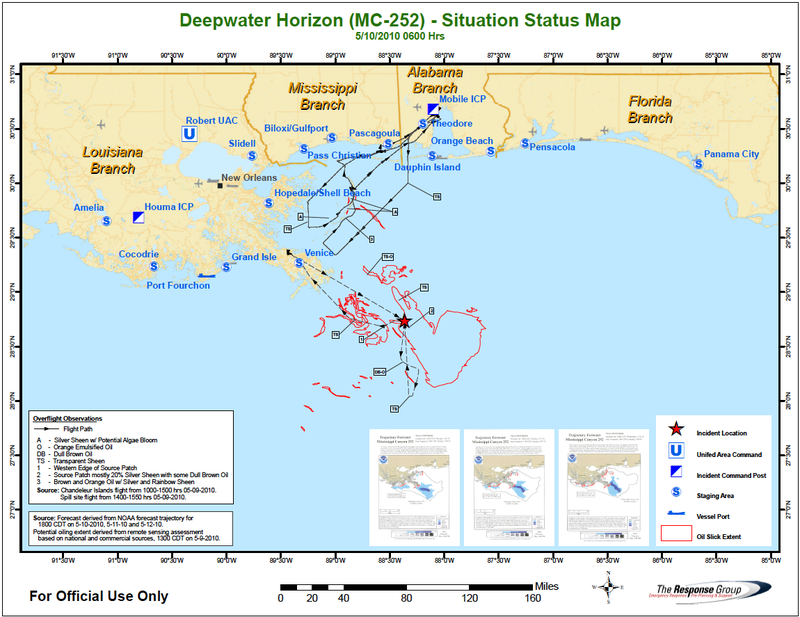 The NOAA Fisheries Services has created a Trajectory Forecast Map which calculates the possible path the oil will take as it spreads. 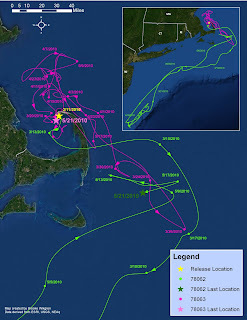 Drift analysis, wind directions, tides and many other data sets are used to create trajectory maps. These maps help determine where response teams and equipment will be placed. I'll do my best to keep you all updated as more information becomes available. As the expanding oil spill threatens wildlife in the Gulf of Mexico, the Aquarium's Marine Animal Rescue Team is preparing for possible response scenarios. The National Marine Fisheries Service (NMFS), part of the National Oceanographic and Atmospheric Administration (NOAA), is already on the scene at an Incident Command Center. The Aquarium is part of the National Marine Stranding Network, and it is very likely that we will be called in to help rehabilitate animals affected by the spill. 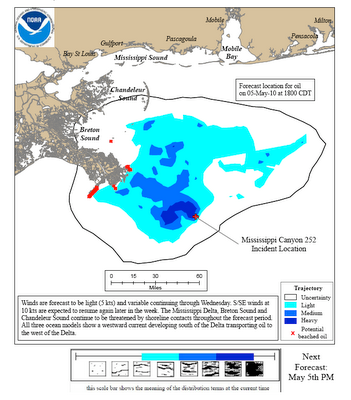 The current oil spill estimate from www.noaa.gov. Training and certification is essential during times like this, and our rescue team is trained in Incident Command, which is the organizational system used by the federal government in large-scale incidents. 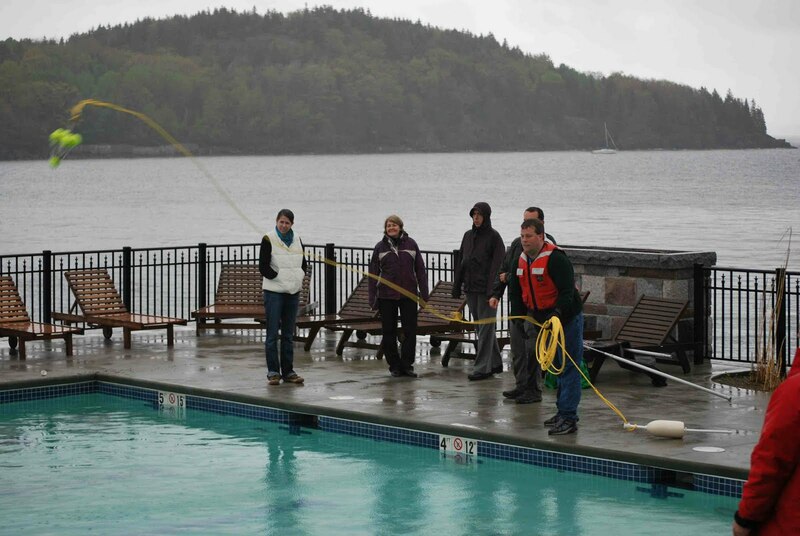 We also have oil spill training which includes familiarity with the systems, tools and safety precautions necessary during an oil spill response. 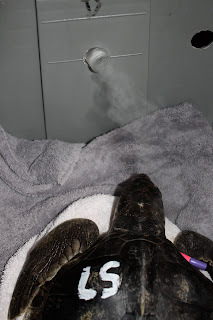 Above, one of this year's rescued sea turtles, Voyageurs, is getting some fluid therapy to help with electrolyte imbalance. Read more about this rescue in this post. Sea turtles are one of the many species the rescue team has experience treating that will likely be affected by the oil spill. Most of the training surrounding oil spills focuses on how to de-oil animals. This is particularly important for sea birds. Sea turtles will likely be much easier to de-oil, but the major danger will be injury due to inflammation of the mucous membrane, ingestion and respiratory problems. Many of these problems will be the same for marine mammals. Right now, I am headed to a stranding network meeting in Maine, where I will learn more about the response strategy to this spill. There is an additional certification necessary, Hazardous Waste Operations and Emergency Response (HAZWOPER), for teams to be on the ground removing animals from the oil. Right now, no one on the Aquarium staff has that training, but our expertise with sea turtle rescue and rehabilitation will definitely be useful at nearby rehabilitation centers on the gulf coast. Note on volunteering: Right now, we are referring people to BP's oil spill info line to get more information on volunteering: (866) 448-5816. Welcome to our new Rescue Department Field Volunteers!!! What an exciting day of learning and community spirit! 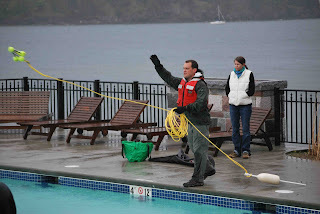 The Rescue Department staff recently completed the last field volunteer training for 2010. We had a full house for this training event, which was a lot of fun and a tremendous success! 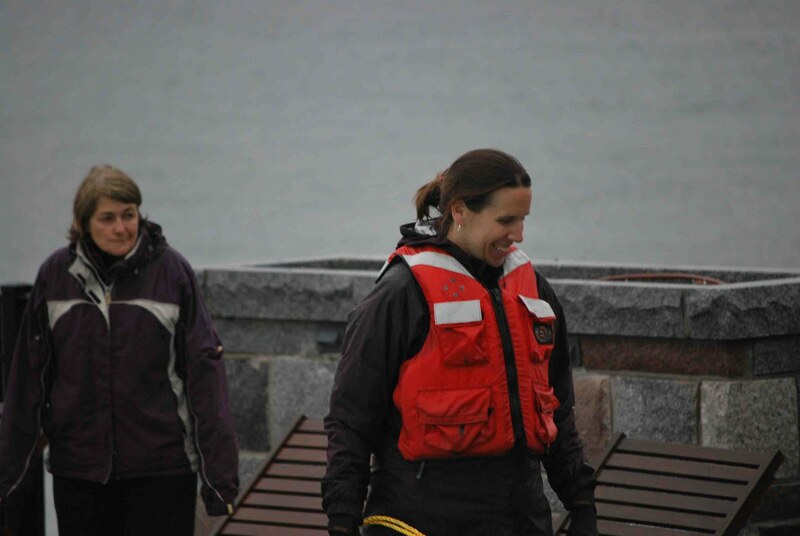 The group of trainees included local citizens from all walks of life. 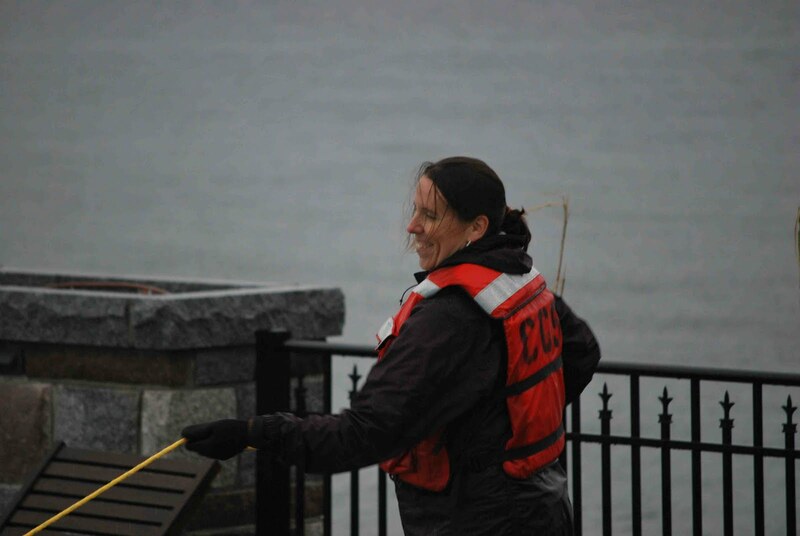 In common is their desire to become involved in the Aquarium's efforts to respond to marine animals in distress and to collect important data from animals found deceased on our beaches. 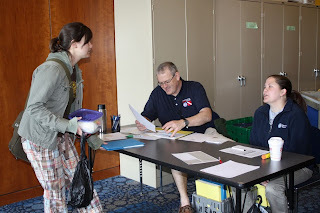 In the photo below, long time Rescue Department volunteers, Charles and Sarah, staff the registration table for the training workshop. 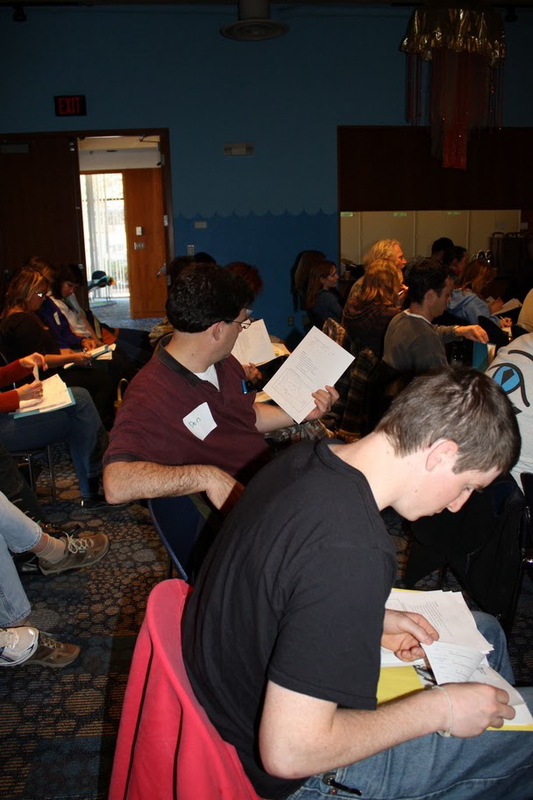 In the photos below our workshop participants listen to Anthony, from the Aquarium's volunteer office, welcome them to our organization. 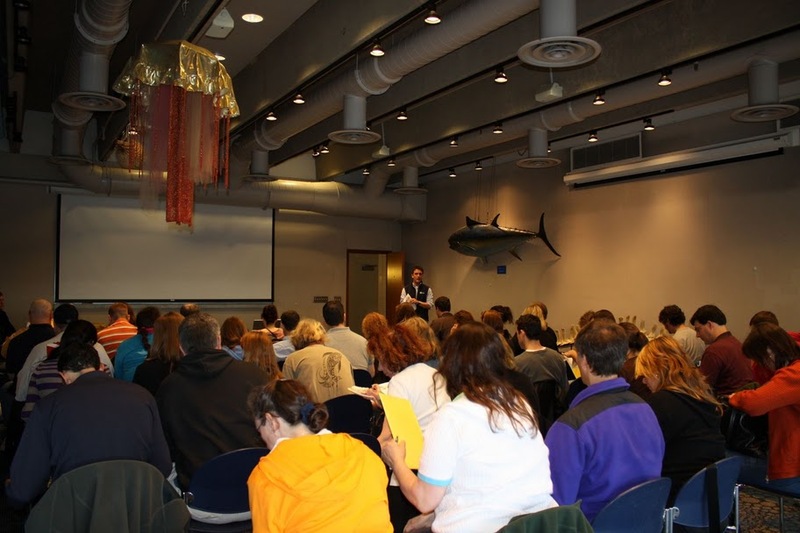 Each participant was given a packet of materials they will need for their field work and to become familiar with the Aquarium's policies. The workshop lasted nearly a full day and included a lot of detailed information. 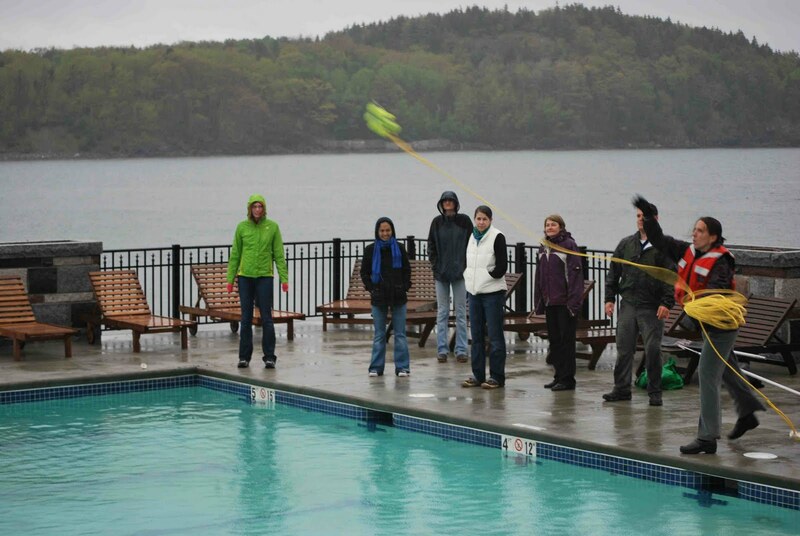 We made it as fun as possible for the participants and they responded with their own good cheer. 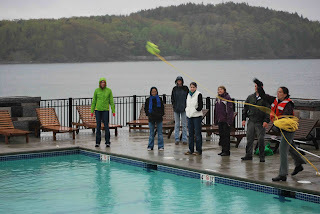 They all came prepared to learn, to participate in the activities and truly seemed to be enjoying themselves. 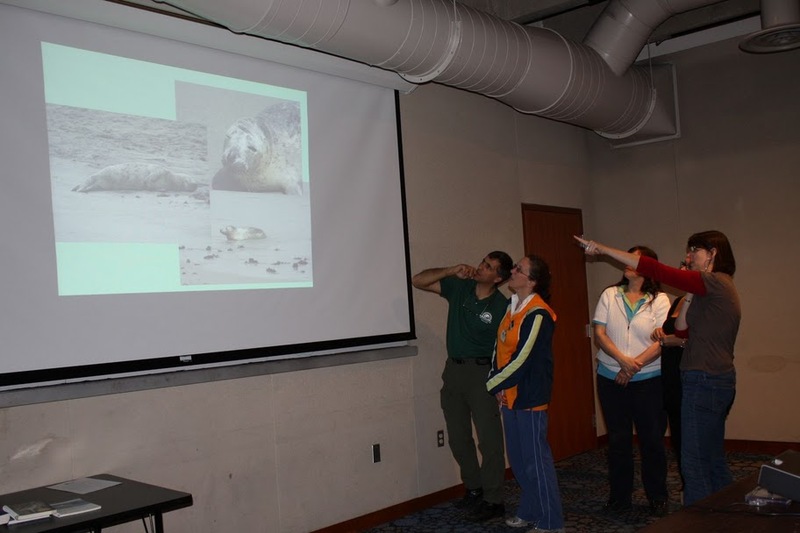 One of the first orders of business was to teach our new responders how to identify the different species of pinnipeds (seals), cetaceans (whales, dolphins and porpoises), and sea turtles. 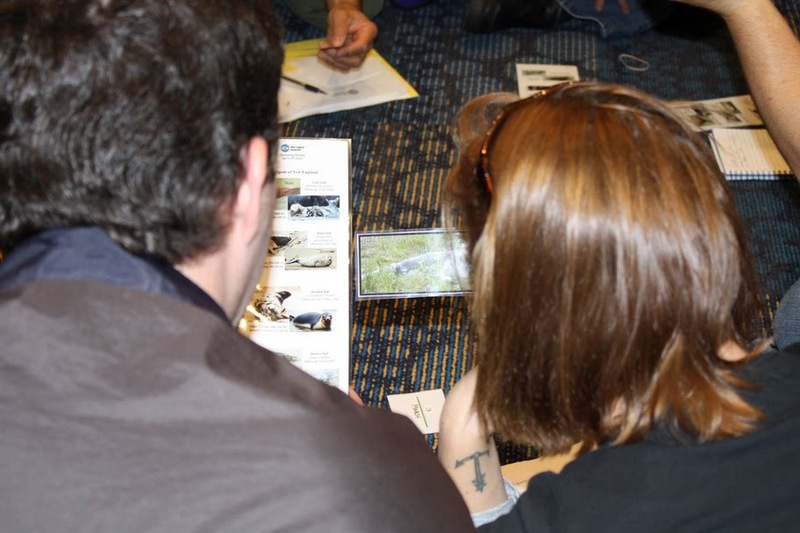 In the photo below Ulrika reviews common field markings to help them identify the animals they will soon begin working with in the field. In the photo below Kerry takes the group through a series of slides teaching them the basics of performing a visual health assessment on stranded and or resting seals. After this part of the workshop, the participants are broken into groups to review photo cards we prepared. Their job is to work as a team and determine the species and the health indicator they see in each photo. I always enjoy this part the most. Usually field response draws caring and active people, people like us who want to have a positive impact on the ocean and the animals that live in and around it. We generally see an instant bond between the participants and this workshop was no different. People who had never met were working together, and having a lot of laughs doing it, all to learn this new information. It was fun to watch and be a part of. 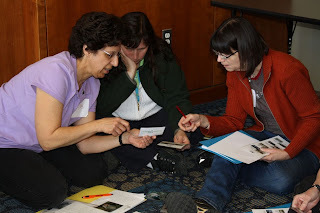 In the photos below the new volunteers work together to determine species and health conditions of the animal on each photo card. Note: The giant penguin in the center photo was not a participant, just a silent observer and permanent resident of our lecture center. I love that it looks like the penguin is looking at the photo cards along with the group! In addition to the photo cards, our new volunteers were challenged throughout the presentations to test their new skill set. 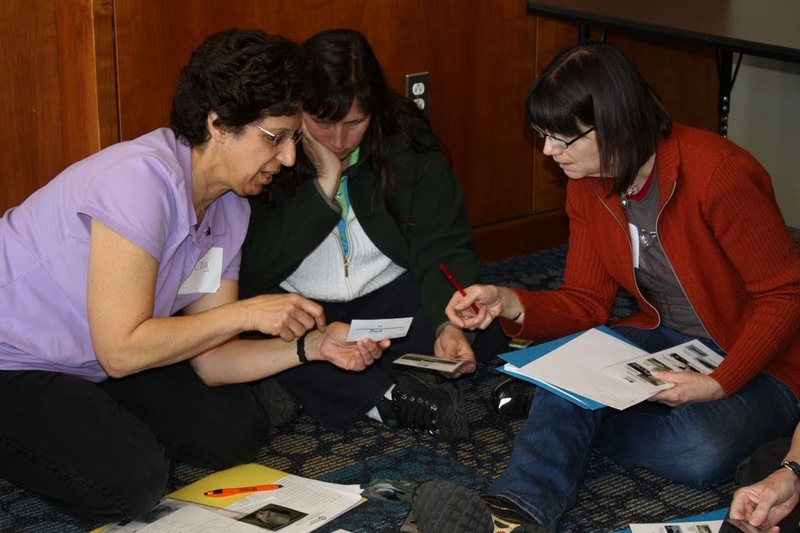 In the photo below, a small group works together to identify the species in the photos and to correctly assess all the positive and or concerning health issues they see. In addition to the species identification, health assessment per species, general Rescue Department information, tips for how to communicate this information to the general public on the beach, and safety concerns... they also learned how to collect important life history data from any dead animals found on the beach. In the photo below, Adam reviews one of many important measurements that need to be collected from deceased animals. Most of the data collection is instituted by the NOAA Fisheries and is collected in the same manner across the National Stranding Network. We covered a lot of information during this long workshop. They won't be expected to remember everything they learned for immediate solo application. They will be working in pairs as often as possible, usually being paired up with a long term field volunteer so they can learn from each other. In addition and most importantly, they will be in constant communication with Rescue Staff members who will be responsible for determining the best course of action in each case. 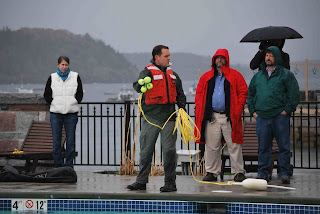 This was a great day for all who participated, including all of us in the Rescue Department. I may have enjoyed this day more then anyone. I am always touched by people who are active in their community and pursue their interests. Everyone who participated in this workshop did so to become involved in something they care about and to make a difference. They gave us their undivided attention, participated actively and kept their humor throughout the day. We enjoyed a lot of laughter throughout the day, which set the stage for a fun day of learning. We would like to officially welcome all our new field volunteers to the Rescue Department! GO TEAM!